allnurses is a global site reaching nurses and students around the world. What started out as one page with eight links back in 1997 is now the largest networking site for nurses, students, and educators. Our content is generated by professionals who represent more than 60 different nursing specialties. They come from all over the world to network, share, and learn. 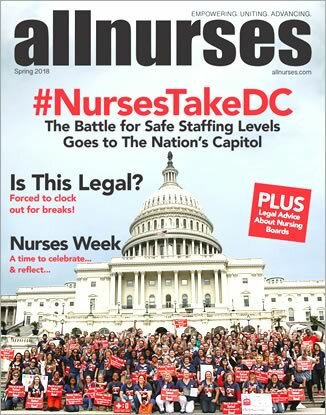 Regardless of country, age, or education, you are welcome at allnurses.com. Have a question? Check our Site Frequently Asked Questions. To empower, unite, and advance every nurse, student, and educator. To become the premier destination for the nursing community — supporting the profession by providing a place to network, share, and learn all things nursing. Thank you to all our readers! Without you this wouldn't be possible. Mary, BSN, RN is the Community Director for allnurses.com. She's been part of allnurses since 2006. Mary has 35 years experience in Peds, Med-Surg, Disaster Nursing, Home Health, Psych, Parish Nursing and Social Media. Judi has 25+ years of nursing experience, the last 12+ as an APRN in a large nephrology practice. She is a USN vet and volunteers on her rural fire dept. Julie has over 36 years of experience growing a successful business. As a Wisconsonite, she spends her freetime riding bike in the summer, her snowmobile in the winter, and Badger/Packer football in the fall. Gregg has been working with digital publishers for over 12 years in various roles. He's helped clients with social media marketing, advertising, digital media sales, and revenue/monetization. Brian (Sorenson) joined the allnurses.com team in 2014 and has an extensive background in advertising, graphic design, marketing and social media management. Bachelors from SCSU with a major in management and minor in marketing. I have 8 years experience in recruitment and 3 years experience in recruitment sourcing. As the Information Technology Director for allnurses.com, Joe has over 20+ years working in the field. When he's not working, you can find him at a Spartan Race event or enjoying a hiking trail with his wife. Dave has over 30 years of development/IT experience in the healthcare industry. He has a BS degree from UW Eau Claire in math and computer science. Dave enjoys playing golf and volleyball and follows University of Minnesota Gopher sports.